1 Dead, 1 In Critical Condition After Motorcycle Crash In Delray Beach | Schuler, Halvorson, Weisser, Zoeller & Overbeck P.A. One man is dead and another man is in critical condition after a fatal motorcycle crash happened in Delray Beach, Palm Beach County, and the Florida Highway Patrol. Delray Police officials responded to a car crash in the Lucaya Delray neighborhood, near West Linton Boulevard and South Congress Avenue. The Florida Highway Patrol officials said a white Toyota 4Runner, driven by 76-year-old man, was eastbound on Linton Boulevard. At the same time, witnesses told police two motorcycles sped westbound. The 76- year old driver turned left across eastbound traffic into the Lucaya neighborhood, a 23-year-old motorcyclist, identified as Frank Carollo, crashed into the 4Runner’s rear passenger tire, Florida Highway Patrol said. As the SUV spun around, the second motorcycle, driven by 44-year-old Michael Yesilevich, crashed head-on into the vehicle. Carollo, of Lantana, died at the scene. Yesilevich, of Delray Beach, remained in critical condition at Delray Medical Center,, Florida Highway Patrol officials said. The 76-year old driver, who remained at the scene, was uninjured. 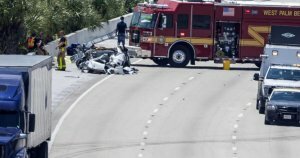 Anyone with additional information about this crash is asked to contact traffic the Palm Beach traffic homicide investigators on the Florida Highway Patrol officials.